Go to the shop screen and press the A button. Then press it again three times. The merchant's face expression changes. Then hurry up and put in the code before his expression goes back to normal because then you have to press the A button again! It was also the first toy to have a visible antenna. Sound: Press A and C.
Marrying via The Matchmaker: When your tama is old enough, the matchmaker will visit him/her. When you see her, press any button to continue. She will present you with a tama of a different gender. Choose if you want to marry him/her. When you marry, your tama will have a baby. Your tama will stay with the baby for two days. After that, your tama will go back to Tamagotchi Planet and leave you with the baby. Marrying via Connection: If two tamas of different genders connect a lot, they will get married. The female tama will have two babies, one for her, and one for the husband. Your Tama Is Gone... If there is a floating angel on the screen and the only thing accessible is the Pet Stats screen, your tama had died. To get a new egg, press A and C.
Input the username to your v3 toy. Whenever you get a code, go to the "Password" section of the "Games/ Shop" menu and enter it there. 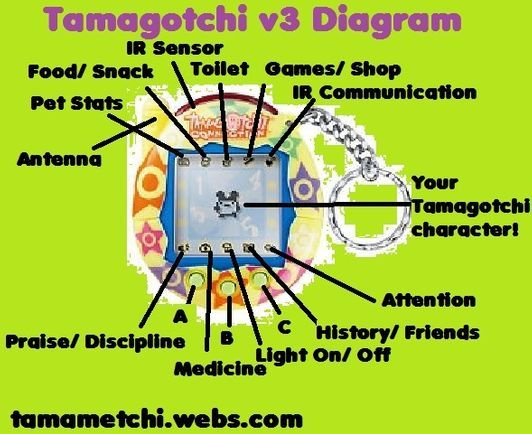 You will aslo get a special code from your v3 toy to go see your parents or grandparents in Tamagotchi Town (if your tama is 2nd gen. or above.) Bonus! There are special hidden items all over Tamagotchi Town. If you find them all, you will get a special code for a Golden Tamagotchi toy for your tama character! Get ♪: Use the A Button (left) and the C Button (right) to collect the musical notes. If you catch poop or miss a musical note, you lose the game. Catch 100 musical notes to win. Bump: Press the A Button when "PUSH!" appears on the screen. Press the C Button to stop the meter. Hint: Press the C Button when the meter is completely white. Also, if your tama has a heavier weight, it will have a better chance of winning. Flag: Select the correct flag when the example appears on screen. Heading: Press the A Button (left) and the C Button (right) to move. Press the B Button to jump. Try to hit the ball without letting it hit the ground. Sprint: Press any button repeatedly to get your tama to the finish line first.